This article is about the biblical Methuselah. For other uses, see Methuselah (disambiguation). Methuselah (Hebrew: מְתוּשֶׁלַח Metushelaḥ "Man of the javelin" or "Man of Selah") was a biblical patriarch and a figure in Judaism, Christianity, and Islam. Said to have died at the age of 969, he lived the longest of all figures mentioned in the Bible. According to the Book of Genesis, Methuselah was the son of Enoch, the father of Lamech, and the grandfather of Noah. Elsewhere in the Bible, Methuselah is mentioned in genealogies in 1st Chronicles and the Gospel of Luke. His life is described in further detail in extra-biblical religious texts such as the Book of Enoch, Slavonic Enoch, and the Book of Moses. Bible commentators have offered various explanations as to why the Book of Genesis describes him as having died at such an advanced age; some scholars believe that Methuselah's age is the result of mistranslation, while others believe that his age is used to give the impression that part of Genesis takes place in a very distant past. Methuselah's name has become synonymous with longevity, and he has been portrayed and referenced in film, television, and music. 21 When Enoch had lived sixty-five years, he became the father of Methuselah. 22 Enoch walked with God after the birth of Methuselah three hundred years, and had other sons and daughters. 23 Thus all the days of Enoch were three hundred sixty-five years. 24 Enoch walked with God; then he was no more, because God took him. 25 When Methuselah had lived one hundred eighty-seven years, he became the father of Lamech. 26 Methuselah lived after the birth of Lamech seven hundred eighty-two years, and had other sons and daughters. 27 Thus all the days of Methuselah were nine hundred sixty-nine years; and he died. According to the chronology of the Bible, Methuselah died during the year of the flood; however, whether his death was caused by the flood, or preceded it, the Bible is silent. He was also the oldest of all the figures mentioned in the Bible. Methuselah is mentioned once in the Hebrew Bible outside of Genesis; in 1 Chronicles 1:3, he is mentioned in a genealogy of Saul. Methuselah is mentioned a single time in the New Testament, when the Gospel of Luke traces Saint Joseph's lineage back to Adam in Luke 3 (Luke 3:23–38). A depiction of Methuselah at the Church of San Juan Bautista in Carbonero el Mayor, Segovia Province, Spain. The apocryphal Book of Enoch claims to be revelations of Enoch, transcribed by him and entrusted to be preserved for future generations by his son, Methuselah. In this book, Enoch recounts two visions he has had to Methuselah. The first is about the Genesis flood narrative, and the second chronicles the history of the world from Adam to the Last Judgment. In the latter vision, men are represented as animals - the righteous are white cattle and sheep, the sinners and enemies of Israel are black cattle and wild animals. Following his father's death in the Book of Enoch, Methuselah is designated by God as a priest, while Methuselah's grandson, Noah's brother Nir, is designated by God as his successor. In Slavonic Enoch, Methuselah asks his father for a blessing, and is given instructions on how to live righteously. After their father ascends into heaven, Methuselah and his brothers build an altar and made "a great festivity, praising God who had given such a sign by means of Enoch, who had found favor with Him." The Book of Jubilees presents itself as "the history of the division of the days of the Law, of the events of the years, the year-weeks, and the jubilees of the world" and claims to be a revelation of God to Moses, given through the Angel of the Presence in addition to the written Law received by Moses on Mount Sinai; and, while the written Law was to be imparted to all, this was to be a secret tradition entrusted only to the saints of each generation, to Enoch, Methuselah, Noah, and Shem, then to Abraham, Isaac, Jacob, and Levi, and finally to the priests and scribes of the latter times. Rabbinic literature states that when Noah was four hundred and eighty years old all the righteous men were dead, except Methuselah and himself, who were of immense stature as they were descended from the sons of God. At God's command they both announced that one hundred and twenty years would be given to men for repentance; if in that time they had not mended their evil ways, the earth would be destroyed. But their plea was in vain; even while Noah was engaged in building the ark the wicked made sport of him and his work, saying: "If the Flood should come, it could not harm us. We are too tall; and, moreover, we could close up with our feet [which were of monstrous size] the springs from below." They resorted to these tactics; but God heated the water, and their feet and the flesh of their bodies was scalded. The 17th century midrashic Sefer haYashar ("Book of Jasher") describes Methuselah with his grandson Noah attempting to persuade the people of the earth to return to godliness. All other very long-lived people died, and Methuselah was the only one of this class left. God planned to bring the flood after all the men who walked in the ways of the Lord had died (besides Noah and his family). Methuselah lived until the ark was built, but died before the flood, since God had promised he would not be killed with the unrighteous. The Sefer haYashar gives Methuselah's age at death as 960. Methuselah (Arabic: Mattūshalakh) is also mentioned in Islam in the various collections of tales of the pre-Islamic prophets, which also say he was an ancestor of Noah. Furthermore, early Islamic historians like Ibn Ishaq and Ibn Hisham always included his name in the genealogy of Muhammad. The Book of Moses, a Mormon text, says that after Enoch and the City of Zion were taken up to heaven, Methusaleh stayed behind; this was so that God's promises to Enoch - that he would always have descendants on earth and that he would be an ancestor of Noah - would be fulfilled. The Church of Jesus Christ of Latter-day Saints further teaches that Methuselah was a prophet. 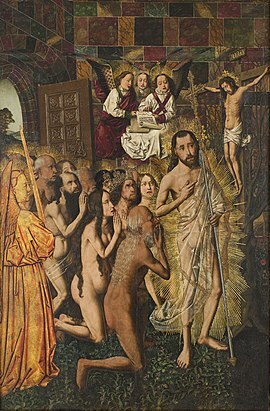 Bartolomé Bermejo, Christ Leading the Patriarchs to Paradise, c. 1480. In this depiction of the Harrowing of Hell, Methuselah is portrayed as leading the procession of the righteous behind Jesus, along with Solomon, the Queen of Sheba, and Adam and Eve. Interpretations of the Bible following biblical literalism take Methuselah's 969 years to be 969 solar years. Some literalists attempt to give certain arguments for how this could be: early humans had a better diet, or a water vapor canopy protected the earth from radiation before the Flood. Others introduce theological causes: humans were originally to have everlasting life, but sin was introduced into the world by Adam and Eve, its influence became greater with each generation, and God progressively shortened human life, particularly after the Flood. The Catholic Encyclopedia says "Certain exegetes solve the difficulty to their own satisfaction by declaring that the year meant by the sacred writer is not the equivalent of our year." Some believe that Methuselah's extreme age is the result of an ancient mistranslation that converted "months" to "years", producing a more credible 969 lunar months, or 78½ years, but the same calculation applied to Enoch would have him fathering Methuselah at the age of 5 using numbers from the Masoretic Text. Donald V. Etz suggested that the Genesis 5 numbers "might for convenience have all been multiples of 5 or 10". Ellen Bennet argued that the Septuagint Genesis 5 numbers are in tenths of years, which "will explain how it was that they read 930 years for the age of Adam instead of 93 years, and 969 years for Methuselah instead of 96 years, and 950 years for that of Noah instead of 95 years"... "Surely it is much more rational to conclude that Noah lived 50 years instead of 500 years before he took a wife and begat Shem, Ham, and Japheth." and lists the Septuagint total ages with decimal points: 93.0 for Adam, 91.0 for Cainan, 96.9 for Methuselah, 95.0 for Noah, etc. Robert M. Best provided a similar table of the same Septuagint Genesis 5 numbers with decimal points inserted in the same tenth position. There is also the possibility that the ages represent not the length of life of an individual but rather the time span of a dynasty. Under this interpretation, it isn't that Methuselah lived for 969 years but rather that his clan had "dominion" for that period. Kenneth Kitchen states that all the numbers of Genesis 5, including Methuselah's age, have no meaning at all, and calls them "pure myth", Yigal Levin states that these long lifespans are intended simply to speed the reader from Adam to Noah. Claus Westermann states they are intended to create the impression of a distant past. The Sumerian King List mentions a character named Ubara-Tutu who seems almost identical to Methuselah. He was the son of En-men-dur-ana, a Sumerian mythological figure often compared to Enoch, as he entered heaven without dying. Ubara-Tutu was the king of Sumer until a flood swept over his land. Although the ages of Methuselah and Ubara-Tutu are different, their year of death are the same. Babylonian writer Berossus also claims that, prior to the events of Babylon's flood myth, kings could live for tens of thousands of years, which bears some similarity to Genesis 5. In Forever Young: A Cultural History of Longevity, Lucian Boia says that the Bible's portrayal of Methuselah and other long lived figures features "traces of the Mesopatamian legends" found in the Epic of Gilgamesh, where Gilgamesh rules Uruk for 126 years, and his ancestors are said to have ruled for several hundred years each. Boia also notes that tales of kings who lived for thousands of years can be found in both Indian and Chinese mythology, and that the Bible is comparatively "restrained" in depicting early humans as being able to live for hundreds of years, rather than thousands. Boia notes that following the Flood, the Bible depicts its character's lifespans as gradually diminishing; Noah's sons lived between 400 and 500 years, while Abraham died at 175, Moses died at 120, and David died at 70, an age that the Bible portrays as old for David's time period. Boia compares early biblical figures and their vast lifespans to the people of the Golden Age in Hesiod's poem Works and Days, whose bodies are perpetually youthful. Methuselah's father Enoch, who does not die but is taken by God, is the seventh patriarch, and Methuselah, the eighth, dies in the year of the Flood, which ends the ten-generational sequence from Adam to Noah, in whose time the world is destroyed. Boia believes that Methuselah serves the symbolic function of linking the Creation and the Flood, as Adam would have died during Methuselah's lifetime and Methuselah could have learned about the Garden of Eden from Adam. The kings of the Sumerian King List lived for over a thousand years, and Mesopotamians believed both that living over a thousand years made someone divine or somewhat divine, and that their contemporary kings were descended from the kings of the Sumerian King List. Robert Gnuse hypothesizes that the author of Genesis made all of its characters die before they turned one-thousand as a polemic against these Mesopotamian beliefs, as well as any claim that a king is divine. Gnuse also believes that the author of Genesis said that Methuselah died before he lived a thousand years to show that he was not divine. According to the Catholic Encyclopedia, Methuselah's name "has become a synonym for longevity". Saying that someone is "as old as Methuselah" is a humorous way of saying that someone is very elderly. The word "Methuselarity," a portmanteau of Methuselah and singularity, was coined by Aubrey de Grey to mean a future point in time when all of the medical conditions that cause human death would be eliminated, and death would occur only by accident or homicide. A 7006177168700000000♠4,850-year-old Great Basin bristlecone pine (Pinus longaeva) tree growing high in the White Mountains of Inyo County in eastern California is called Methuselah. The lyrics of George Gershwin's song "It Ain't Necessarily So" (1935) cast doubt on various aspects of the Bible, such as the idea that Methuselah lived so long, the idea that the devil is evil, the story of Jonah, and the story of David and Goliath. Robert Heinlein's book Methuselah's Children contains characters who age slowly or not at all. The character Flint from the Star Trek: The Original Series episode "Requiem for Methuselah" is a nearly-immortal man who was born in ancient Mesopotamia. His identities include Methuselah, Alexander the Great, Solomon, Lazarus of Bethany, Leonardo da Vinci and Johannes Brahms. Flint becomes lonely after living for a time on a deserted planet, and creates an immortal gynoid to keep him company. He eventually begins to slowly die because he left Earth's atmosphere, and dedicates the remainder of his days to the betterment of Mankind. Anthony Hopkins played Methuselah in Darren Aronofsky's 2014 film Noah. In the film, Noah's adopted daughter Ila (played by Emma Watson) is infertile until Methuselah blesses her. Aronofsky's version of Methuselah is a hermit who lives on a mountaintop. In this retelling of the Genesis flood narrative, Methuselah dies during the deluge. In the TV series Altered Carbon, based on Richard K. Morgan's 2002 novel of the same name, a class of people who can afford to live forever by transferring their consciousness into cloned bodies are called "Meths" or "Methuselahs." In 2016, it was announced that producer David Heyman would produce a biblical epic starring Tom Cruise as Methuselah with Joachim Rønning to direct. The film is set to show Methuselah as never aging and possessing "unparalleled survival skills." ^ a b c Molloy, J. (1911). "Methuselah". Catholic Encyclopedia. Retrieved 2017-11-12. ^ a b Twain, Mark, ed. (1995). The Bible According to Mark Twain: Writings on Heaven, Eden, and the Flood. University of Georgia Press. p. 350. Retrieved September 2, 2018. ^ a b c "Methuselah". Encyclopedia Britannica. Retrieved November 12, 2017. ^ a b Krule, Miriam (March 28, 2014). "How Biblically Accurate Is Noah?". Slate. Retrieved September 13, 2018. ^ a b Porter, J. R. (2010). The Lost Bible. New York: Metro Books. p. 38. ISBN 978-1-4351-4169-8. This article incorporates text from a publication now in the public domain: Singer, Isidore; et al., eds. (1901–1906). "Enoch, Books of (Ethiopic and Slavonic)". The Jewish Encyclopedia. New York: Funk & Wagnalls. This article incorporates text from a publication now in the public domain: Singer, Isidore; et al., eds. (1901–1906). "Jubilees, Book of (Τὰ Ἰωβηλαῖα; known also as Little Genesis [ᾙ Κλεινὴ Γένεσις = "Bereshit Zuṭa"]; Apocalypse of Moses; Life of Adam)". The Jewish Encyclopedia. New York: Funk & Wagnalls. This article incorporates text from a publication now in the public domain: Singer, Isidore; et al., eds. (1901–1906). "Flood, The (Hebr. ; LXX. κατακλυαμός).". The Jewish Encyclopedia. New York: Funk & Wagnalls. ^ Sefer Ha-Yashar: Or, the Book of Jasher (1887), Salt Lake City: J. Parry & Co.
^ "Methuselah". Guide to the Scriptures. Retrieved November 12, 2017. ^ Pilch, John J. (1999). The Cultural Dictionary of the Bible. Liturgical Press. pp. 144–146. ISBN 0-8146-2527-4. ^ Hill, Carol A. (December 2003). "Making Sense of the Numbers of Genesis" (PDF). Perspectives on Science and Christian Faith. 55 (4): 239–51. ^ Morris, Henry M. (1976). The Genesis Record: A Scientific and Devotional Commentary on the Book of Beginnings. Grand Rapids, Michigan: Baker Book House. p. 159. ISBN 0-8010-6004-4. Such an interpretation would have made Enoch only five years old when his son was born! ^ Etz, Donald V. (April 1993). "The Numbers of Genesis V 3-31: A Suggested Conversion and Its Implications". Vetus Testamentum. 43 (2): 171–89. doi:10.1163/15685339993X00034. JSTOR 1519351. INIST:4293595. ^ Bennet, Ellen H. (1897). "Cosmogony, or Creation of the World". Astrology: Science of Knowledge and Reason: A Treatise on the Heavenly Bodies in an Easy and Comprehensive Form. New York. pp. 30–7. OCLC 11451986. ^ Borland, James A. (1990). "Did People Live to be Hundreds of Years Old Before the Flood?". The Genesis Debate. Grand Rapids, MI. p. 174. ^ Kitchen, K. A. (1966). Ancient Orient and Old Testament. Downers Grove, IL: InterVarsity Press. p. 40. ^ Levin, Yigal (October 2001). "Understanding Biblical Genealogies". Currents in Research: Biblical Studies. 9: 11–46. ^ Westermann. Genesis 1–11: A Commentary. p. 354. ^ Pritchard, James B. (ed. ), Ancient Near Eastern Texts Relating to the Old Testament (Princeton, N.J.: Princeton University Press, 1955, 1969). 1950 1st edition at Google Books. p.44: "...a flood [will sweep] over the cult-centers; to destroy the seed of mankind; is the decision, the word of the assembly [of the gods]." ^ Gnuse 2014, p. 172-173. ^ Boia 1998, p. 13. ^ Boia 1998, p. 13-14. ^ Abraham Malamat, "King Lists of the Old Babylonian Period and Biblical Genealogies," Journal of the American Oriental Society 88 (1968): 165. See also the discussion of "ten" in the Gen. genealogies in M. Abot section 5, Jacob Neusner, The Mishnah: A New Translation (New Haven, CT: Yale University Press, 1988), 685. Duane A. Garrett also thinks this is deliberate, thus indicating redaction, Rethinking Genesis: The Sources and Authorship of the First Book of the Bible, Ross-shire, Great Britain: Christian Focus Publications, 2000, p. 99. ^ Boia 1998, p. 11. ^ Gnuse 2014, p. 173. ^ "as old as Methuselah". Cambridge Dictionary. Retrieved 2017-11-12. ^ de Grey, Aubrey (2008). "The singularity and the Methuselarity: similarities and differences" (PDF). Archived from the original (PDF) on 2010-06-13. Retrieved 2017-02-24. ^ "Pinus longaeva". Gymnosperm Database. March 15, 2007. Retrieved 2015-01-04. ^ "Ancient Bristlecone Pine Forest". USFS. Retrieved March 11, 2013. ^ "Ancient Bristlecone Pine Natural History". USFS. Retrieved March 11, 2013. ^ Roncace, Mark; Gray, Patrick (2007). "Teaching the Bible Through Popular Culture and the Arts". Society of Biblical Literature. p. 47. Retrieved September 2, 2018. ^ Okuda, Michael; Okuda, Denise; Mirek, Debbie (1999). "The Star Trek Encyclopedia". Pocket Books. Retrieved September 2, 2018. ^ a b Zuckerman, Esther (March 27, 2014). "Why Emma Watson Is the Secret Key to 'Noah'". The Atlantic. Retrieved November 12, 2017. ^ Chaney, Jen (September 2, 2018). "Altered Carbon Is an Over-Stacked Cyberpunk Mess". Vulture.com. Retrieved February 2, 2018. ^ Lodderhose, Diana. "Joachim Rønning Attached To Direct David Heyman's 'Methuselah' With Tom Cruise". Deadline Hollywood. Wikimedia Commons has media related to Methuselah. Herbermann, Charles, ed. (1913). "Methuselah" . Catholic Encyclopedia. New York: Robert Appleton Company.